Remember all the cases sebelom ni masuk suratkhabar pasal people 'wearing' our flags inappropriately? Well. Semalam gi Uptown kat Danau Kota. Ada la gerai jual benda alah kecik kecik. You know those ugly, horrendous (some think of it as cute) things that you stick on your Crocs? 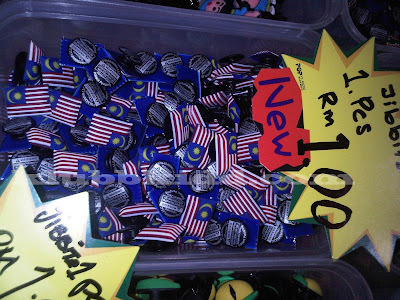 These Jibbitz or whatever they call 'em shoe charms offensively enough for me (apart from the fact they looked like they were manufactured from cheap rubber) - had Malaysian flags for sale. Erm.. honestly. Putting our flag on your feet is patriotic? I mean, you're not talking about colours of the national flag here. You're talking about the image of our flag. If this is supposed to be national pride, we're wearing it on the wrong foot. Let me betulkan sikit - we're just wearing it wrong. yupp.. totally disagree with bout this. Perlu di war-warkan kepada media massa. It's a totally NO-NO. Anoymous : it's a typo, just like it should be 'it's dana kota... and not its danau kota'.